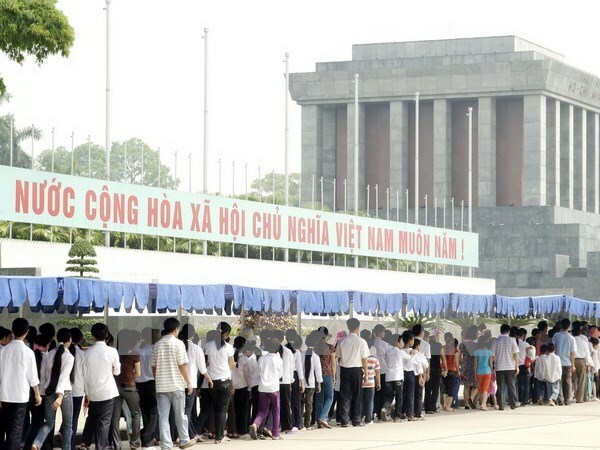 Hanoi (VNA) – More than 66,000 people paid tribute to President Ho Chi Minh at his Mausoleum on May 14-19 on the occasion of the late leader’s 126th birthday. Among these were 11,540 foreigners. The Command of Guards of the Ho Chi Minh Mausoleum has joined hands with the mausoleum management board, Ba Dinh historical and cultural site, Hanoi’s Department of Public Security and Hanoi Trade Corporation to welcome the visitors. On the occasion, the Da Chong (K9) historical relic site in Hanoi’s Ba Vi district also recorded 11,206 visitors offering incense to President Ho Chi Minh. He led the nation to success in the struggle for national independence and in establishing the Democratic Republic of Vietnam following the August Revolution in 1945.